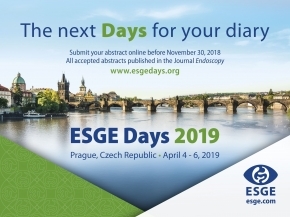 It is with great pleasure that ESGE invites you to submit your abstracts for ESGE Days 2019, our second congress taking place in Prague, April 4-6, 2019. By opening the call for abstracts, ESGE wishes to engage with our participants, to open up a forum which offers authors the opportunity to discuss and disseminate their work on an international stage. ESGE Days encourages work that contains basic, clinical or translational research findings. Submit your abstract under one of the following 8 categories via the website (www.esgedays.org/abstracts) before November 30, 2018 for your chance to actively contribute to ESGE Days 2019.